A View From A Village: Whence inspiration? Five hundred years ago, rather than hitting the markets for last minute Christmas shoppings, the citizens of Rome were queuing round the block to see a work of art that had taken its creator four years to complete. Michelangelo was originally recruited by Pope Julius II to create his tomb, but hardly had the work started and the pope changed his mind: he wanted the ceiling of his uncle's chapel repainting instead. Michelangelo might well have been surprised at the new commission. Not only had he had vast quantities of marble shipped from Carrera already to begin the mammoth undertaking of the pope's tomb, but his reputation was already established as a sculptor, not a painter. Apprenticed in Florence to a workshop that did a lot of fresco work, he had been spotted by Il Magnifico Lorenzo de'Medici for a small figure he had sculpted, and proceeded to make his name with the Pieta in St Peter's in Rome and the rescue of the David in Florence. He was not well-known for painting. 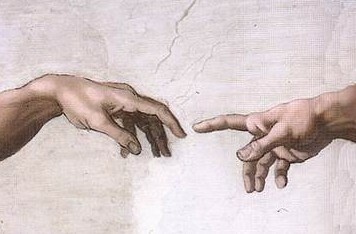 Now the image of God's hand reaching out to touch Adam's fingers is known around the world. Queues of international pilgrims form outside the Vatican Palace to see the ceiling and although Michelangelo's David is well-known, it is actually a replica that is surrounded by camera-laden tourists in the Piazza Signoria, while the original statue is unphotographable in the Accademia a few blocks away. Not the real David, 'just' a life-size replica. I think he would have fumed about this shift in perception. 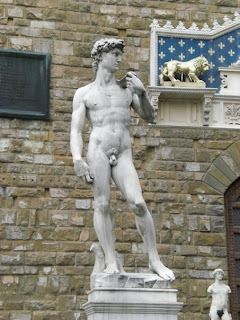 He signed all his letters 'Michelangelo, sculptor'. It was a constant source of irritation to him when painting the ceiling that all that marble was sitting untouched, yet thirty years later he was back in the chapel, painting the altar wall. This time he included himself, a flayed face reflecting how tortured he felt. The additional insult for a fierce Florentine to be trapped in Rome must have been almost unbearable. Thank goodness for his sanity he had some good Roman friends in Tomasso di Cavalieri and the lady Vittoria Colonna. Subsequent popes only added to his burdens; it is no wonder that he had little respect for some of them. This was the starting point for my novel Moses in Chains, now out on kindle. A Florentine who lived in Rome for most of his life, a staunch republican who nevertheless had deep respect for and attachment to the Medici family, a devout man who struggled with his own emotions and fled after one of Savonarola's more fiery speeches, a witty man who wasted no time if he thought others were wrong, a stubborn man, a genius, the Divine Michelangelo. Of course his servants would worship him. Wouldn't they?